We will be making a traditional double screw vise as shown in Randal Holme and Moxon. Also a mallet, a marking gauge, and a marking knife. You will use hand tools to make these four very useful items for your shop and gain the ability to make more of them as needed. Lie-Nielsen Toolworks(R), the premier US manufacturer of heirloom quality woodworking tools, is bringing its popular Hand Tool Event(R) to St. 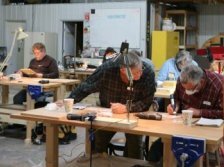 Cloud, MN on March 15-16, 2019 with the Central Minnesota Woodworker’s Association. 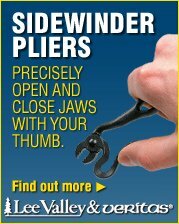 This event is part of the company’s ongoing international program to expose woodworkers of all ages and skill levels to the benefits of traditional hand tools and techniques, and is a rare opportunity for the public to receive first-hand instruction directly from the toolmakers. Mark Laub, a professional wood artist, is nationally known for his distinctive, meticulously detailed furniture. Learn his approach to creative furniture design and share his secrets to exceptional woodworking embellishment. Mark’s knowledge and creativity, combined with his friendly and supportive coaching style, will help you add your personal signature to your woodworking pieces. Ample hands-on opportunity will be provided in addition to lecture and demos.